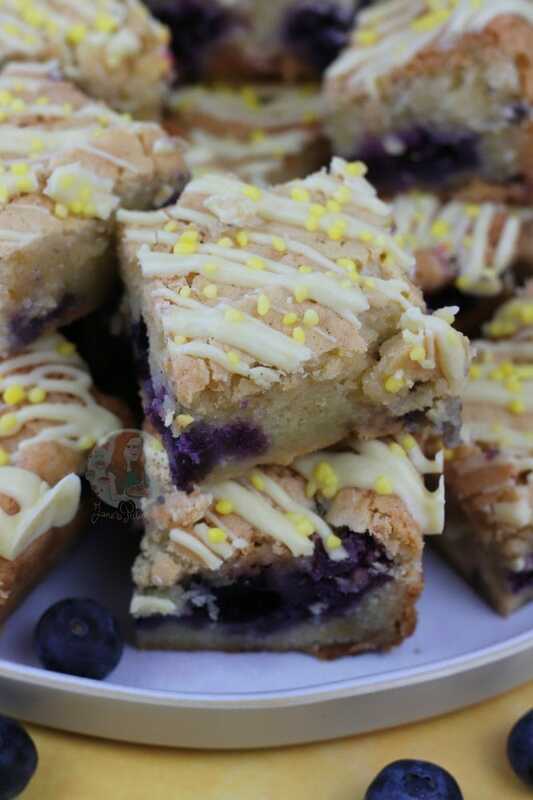 Deliciously Sweet, Light, Lemon & Blueberry Blondies with White Chocolate Chunks! So… yep, THESE ARE THE BEST. 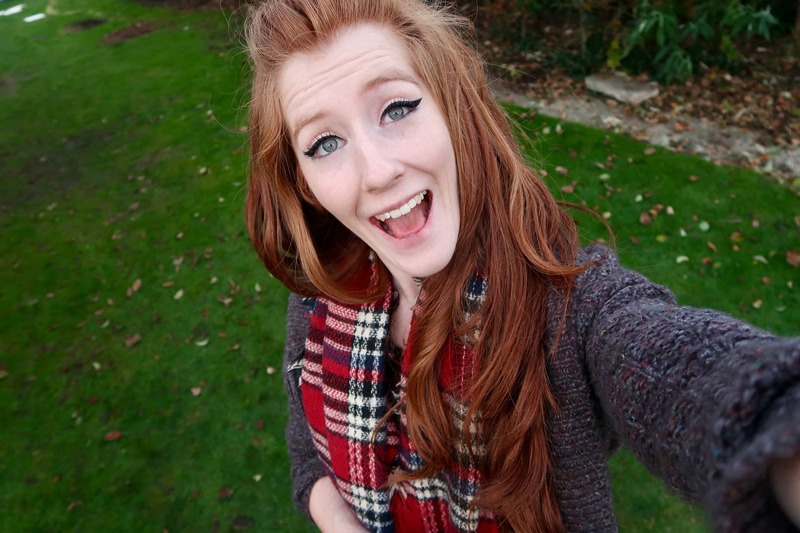 I am honestly astounded at how much I love these, and I am sure you will all love them as well. 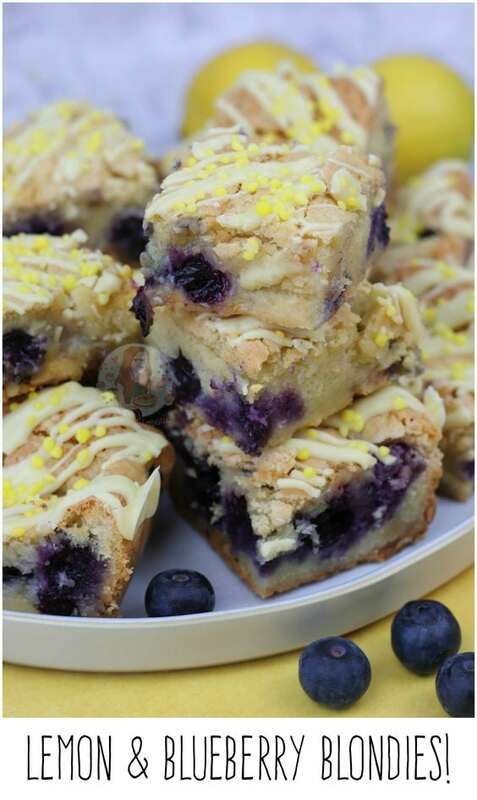 Think a gooey and delicious Lemon flavoured Blondie, with White Chocolate Chunks, and some fresh blueberries… my idea of heaven. 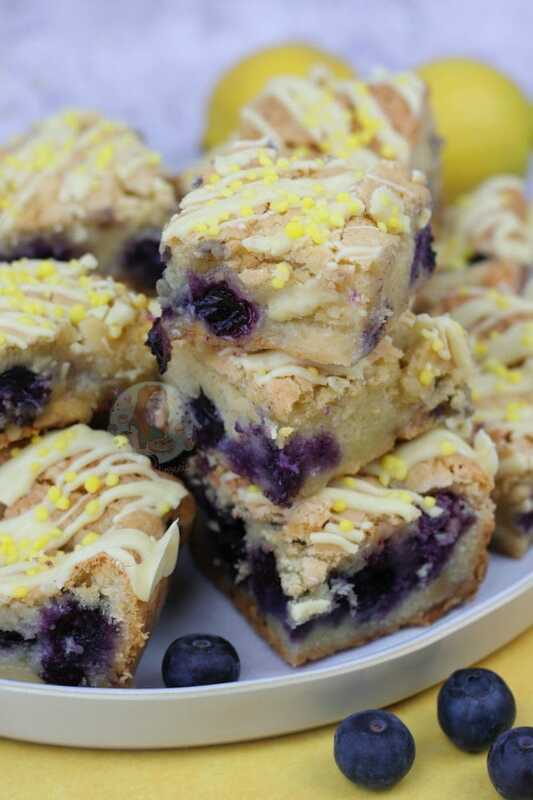 I am Lemon & Blueberry obsessed as it is, so in a ~basicallywhitechocolatebrownie~its HEAVEN. This recipe is basically based exactly on my White Chocolate & Raspberry Blondies, and White Chocolate & Pistachio Blondies and I’m not ashamed of that. 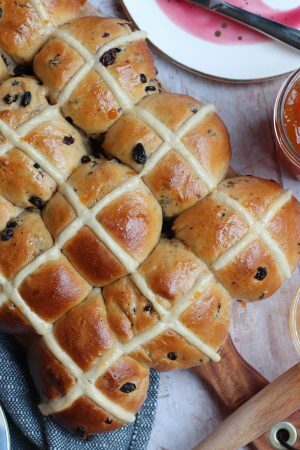 It’s a recipe that works for me, and I have seen so many of you bake them as well that I couldn’t resist! Why mess with something that actually works?! 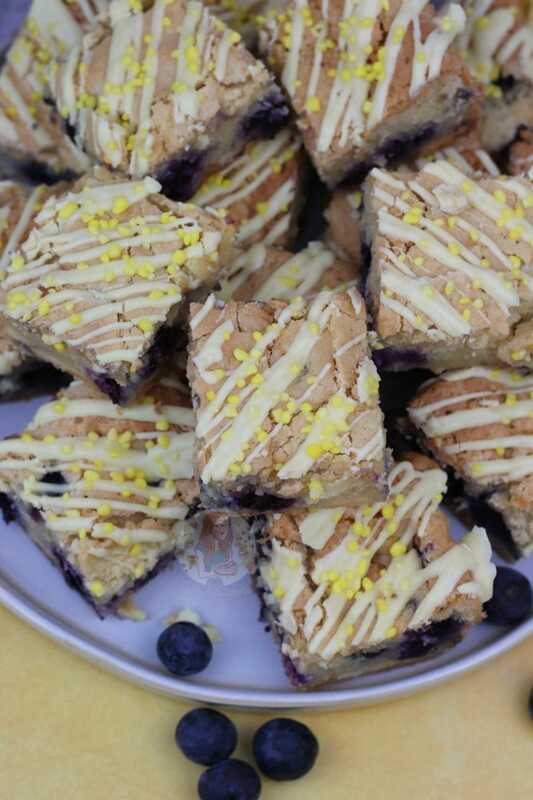 Blondies, if you haven’t heard of them, are basically what is considered a white chocolate brownie. 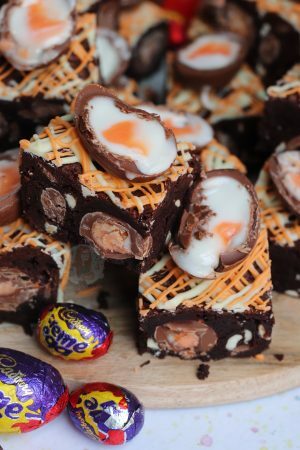 The idea is that a regular brownie usually has a base of dark chocolate, like mine do, or cocoa powder which is what makes them into a brownie. You’d think that you would want these to have a white chocolate base, and I have tried recipes like this, but I wasn’t a fan. I much preferred just making it more of cake mixture style Blondie, and adding in oodles of white chocolate. It worked really well for the other recipes, so I am sticking with it! I obviously had to make this Lemon flavoured however so I thought lemon zest would be best. You can easily use lemon extract if you prefer (two teaspoons)! For these I used fresh blueberries, but they would still work with frozen. Frozen berries can often give out more liquid than fresh due to thawing, but they still work dandy when baked enough! 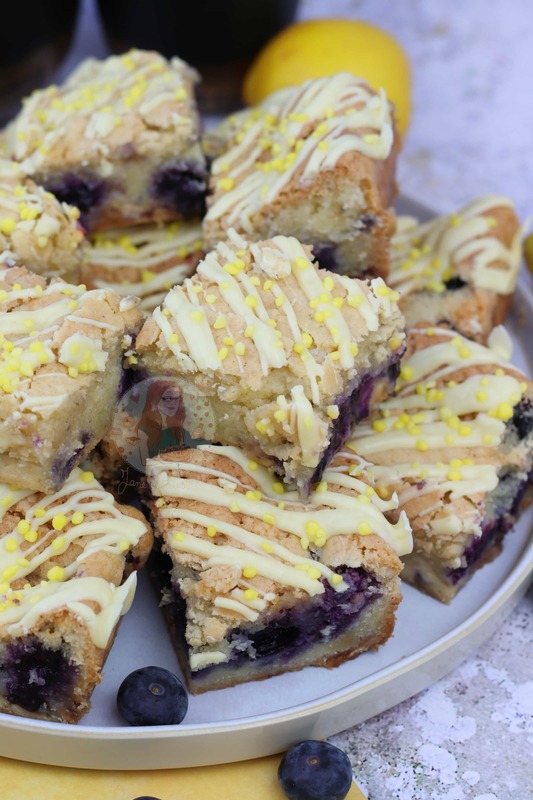 They give a pop of colour in every slice, and just taste completely and utterly delicious. 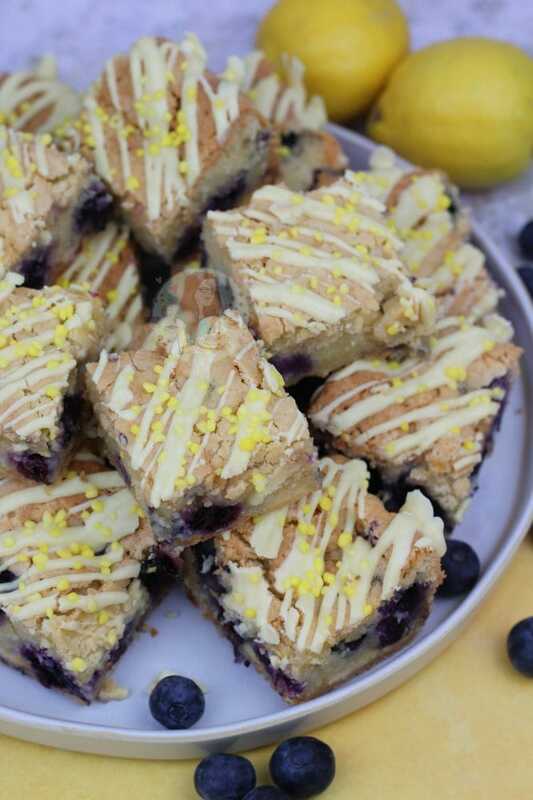 Obviously, if fruit isn’t your thing, then these wont be for you… but you could always just use the lemon, or just the blueberries with the white chocolate! I obviously went a little further with the decoration because I am me after all… but thats that. You don’t have to drizzle white chocolate on the top, but why wouldn’t you want more chocolate in your life?! Preheat your oven to 180C/160C Fan, and grease and line a 9x9inch Square Tin - leave to the side for now. Melt the Butter in the microwave, or in a pan, and stir till smooth. Leave to cool slightly on the side. Using an electric whisk/stand mixer, whisk together the Eggs and Caster Sugar for a good 3-4 minutes or longer, until it has become much thicker, mousse like, paler, and basically doubled in volume. You will know its done when when you lift the whisk up, it will leave a trail on the top of the mixture for a couple of seconds before sinking back in. Once whisked up, continue whisking but gradually pour in the butter. Don't pour it in too quickly or the mixture will split. Once all whisked in. Add in the Flour and Lemon Zest and fold together. Add in the White Chocolate Chips, and half of the Blueberries and fold again. Pour into the tin, and sprinkle on the rest of the Blueberries. Bake in the oven for 35-45 minutes, or until its baked through. Sometimes it can take longer due to some ovens, and if you have actually whisked it up enough in the first place. Once baked, leave to cool in the tin. 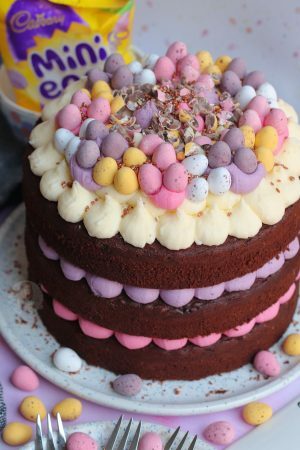 Once cooled, remove from the tin and drizzle over the 100g of melted chocolate for decoration, and some sprinkles to boot! Leave to set and but up into your squares. Sometimes Brownies & Blondies and such can take a while to bake, for some random reason… so if at 35-45 minutes yours isn’t baked through fully, cover the top with foil to prevent burning and continue to bake till done! I have never tried this with frozen berries, and I’m not sure if it would work or not because of the moisture content. 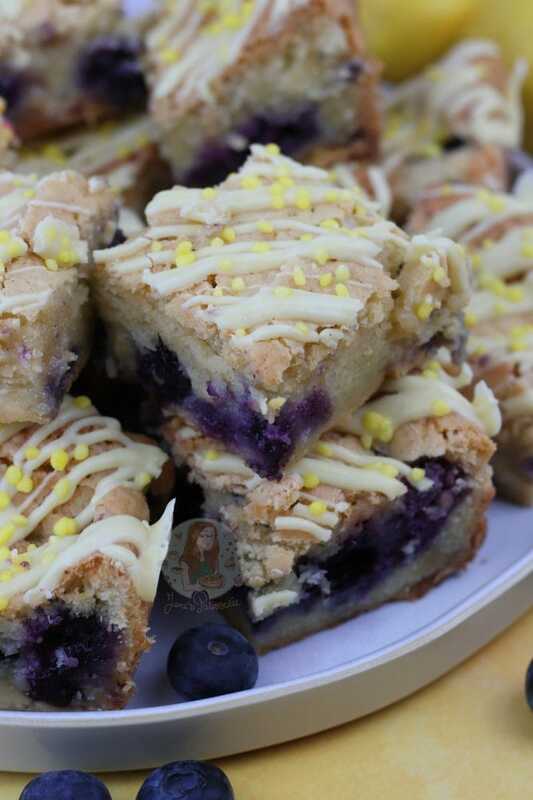 However, I seriously would recommend to NOT add any more blueberries then specified as moisture is released from normal blueberries as well, and the Blondies might not bake very well with any more! The white chocolate chunks are entirely optional, but I just love the flavours of white chocolate and lemon together! These will last in a container for up to 7 days! 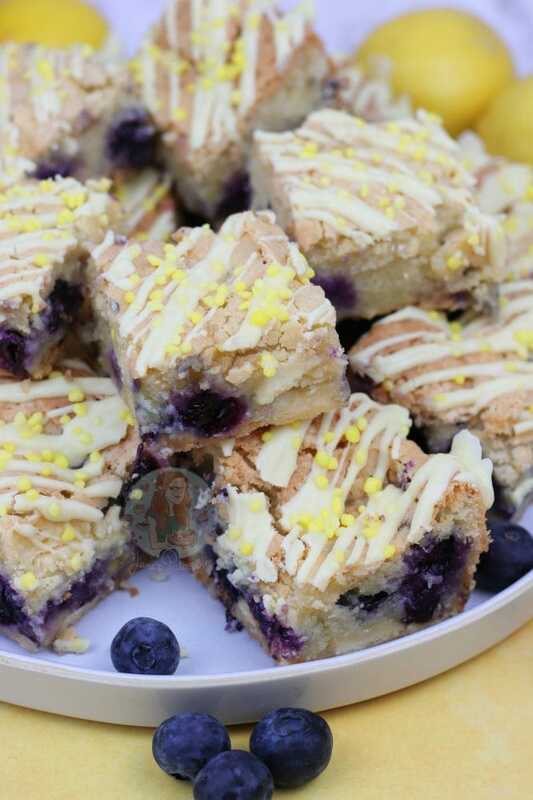 Find my other Blondie Recipes on my Recipes Page! Older Next post: Rhubarb Crumble Cake! Newer Previous post: Toblerone Rocky Road! 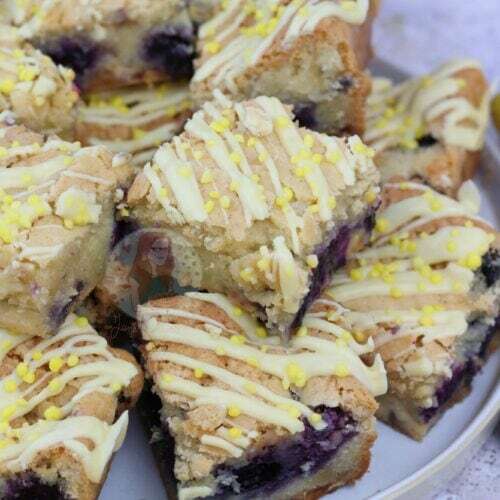 Hi, I really fancy trying this recipe as your blueberry and lemon sponge cake is delicious, just checking do you need to sift the flour before adding to the wet mixture? 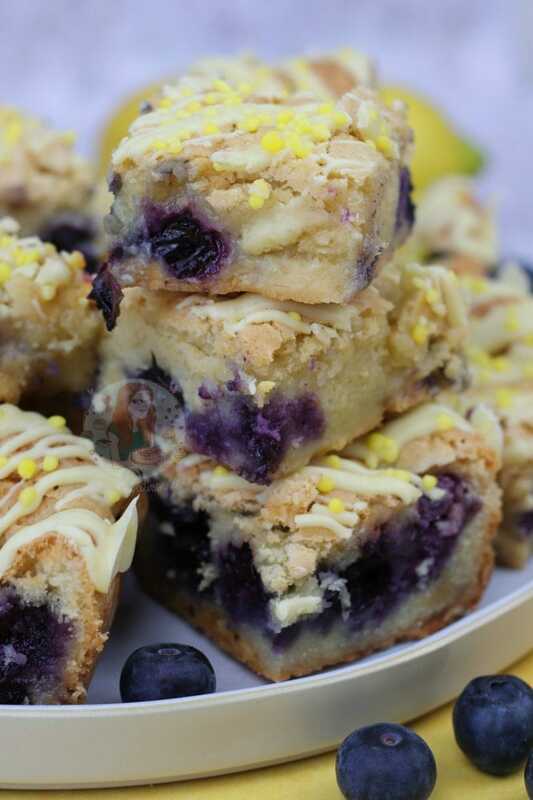 Made these yesterday… Surprised how amazing these were… Beautifully moist and the blueberries in the cake looked amazing too… Never had a problem with every recipe I’ve done on this site…. I love it!! 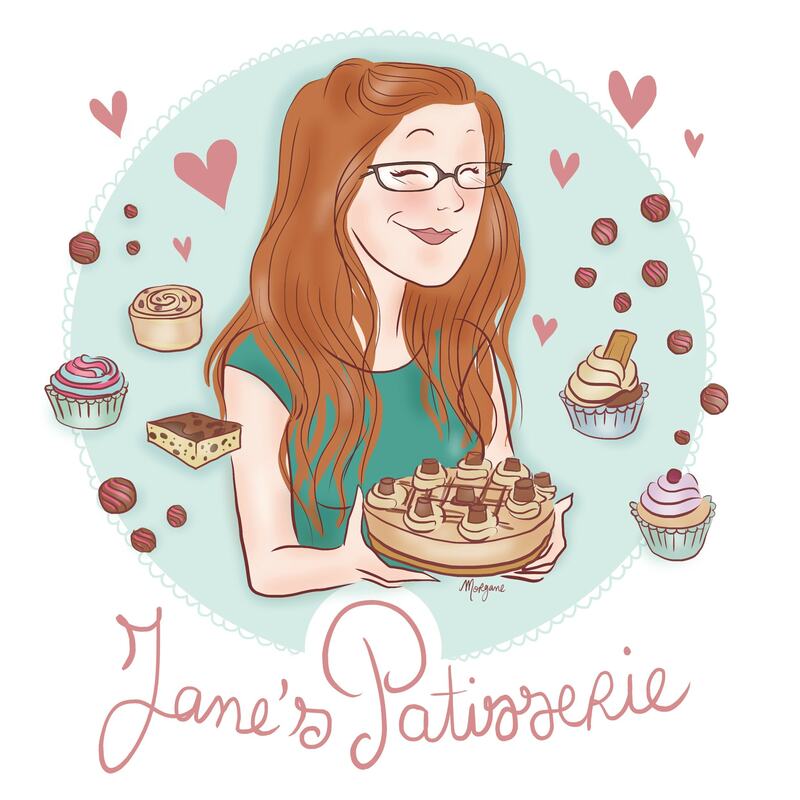 I bake weekly for my friends and receive regular praise for my efforts. However, I have never received thanks as those when I baked this blondie recipe on 20/06/2018. I followed the recipe and baked for 40 minutes. The result was delicious. I have been instructed that I MUST bake this blondie again and soon! Thank you for your recipe. I’m looking forward to trying other recipes soon.